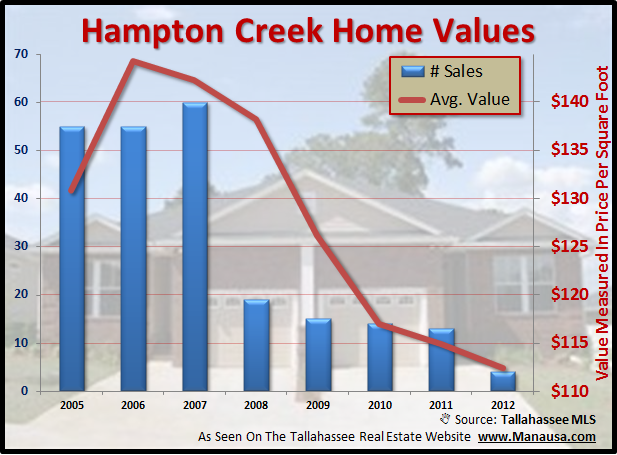 Hampton Creek is another Tallahassee neighborhood that was born during the boom of the housing market, thus we expect a growing mass of frustrated home sellers to be entering the market over the next five years. 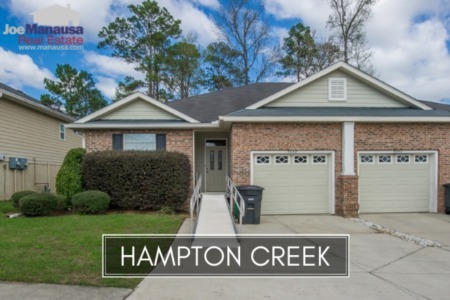 Boom neighborhoods (neighborhoods in Tallahassee that commenced sales from 2000 to 2006) are more susceptible to problems due to the number of homeowners whose move cycle will hit at the same time, and Hampton Creek certainly fits this definition. Historically, the average move time for a Tallahassee homeowner is five to seven years, so neighborhoods who begin during this time frame will have a lot of people needing to move. Additionally, these neighborhoods often have many remaining developed lots, thus the builder/developer is losing money by holding on to them in his or her portfolio. Hampton creek began selling homes in 2005, thus we should be in the very heart of existing home owners needing to sell and move. Considering the pace of home sales in Hampton Creek was greater than 50 per year from 2005 to 2007, we can anticipate that we are building a back-log of wanna-be sellers of more than 40 per year now. 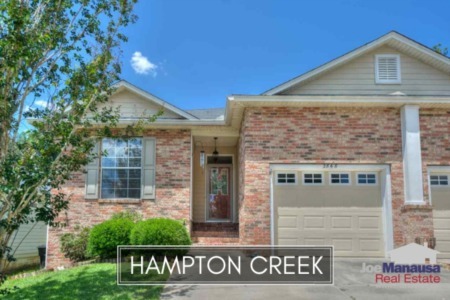 Currently, there are 17 homes for sale in Hampton Creek, and many of these are new construction. Home prices in Hampton Creek vary widely due to the flux of new homes being built. 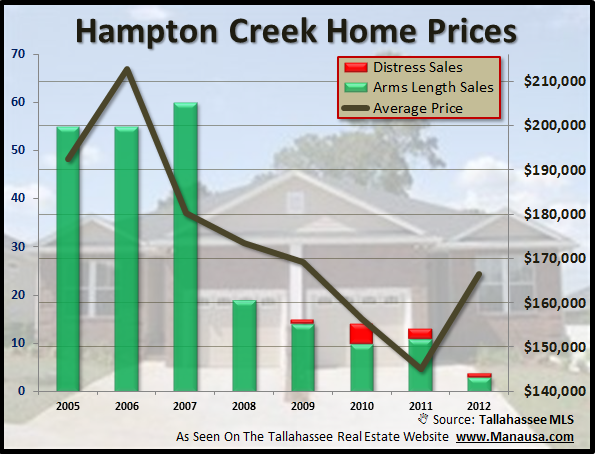 Currently the average price of homes sold in Hampton Creek in 2012 is $166,500, down 22% since the peak of the real estate market. Surprisingly, Hampton Creek has far fewer distressed home sales than neighborhoods that have a similar "born on date." 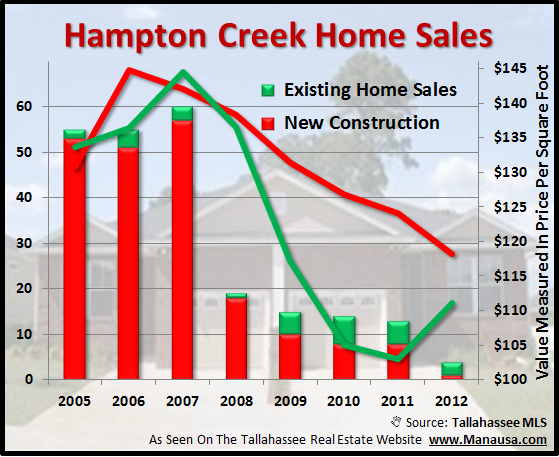 Because of this, home values should be a bit more stable than the other boom neighborhoods in Tallahassee. Currently, average Hampton Creek home values have declined only 22% since the peak of the housing market. With more new construction homes entering the market, Hampton Creek might be getting ready to have a much greater rate of depreciation. Just as we have seen in Southwood and Bull Run, new home construction offerings establish the ceiling for values, and existing home owners have to drop their prices in order to compete. I hope you found this report on Hampton Creek helpful, please check back again often for more Tallahassee neighborhood reports.